All eyes will be on Calgary Flames morning skate Friday to see if Johnny Gaudreau appears. 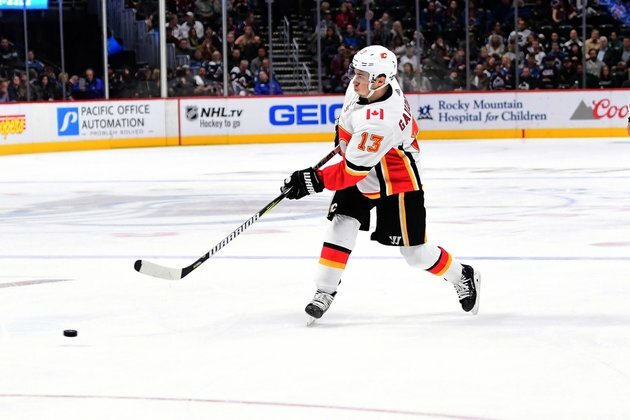 The Flames star winger was levelled by Boston defensemen Charlie McAvoy in the third period of Calgary's 5-2 home ice win on Wednesday. The winger took part in the ensuing power play but then went to the dressing room and didn't emerge for the rest of the game. The Flames did not practice on Thursday and will host the Nashville Predators on Friday. Flames general manager Brad Treliving relayed a message to reporters in Calgary on Thursday that Gaudreau was "fine." The concussion spotter watching Thursday night wasn't so sure after watching McAvoy send the speedster flying after Gaudreau was stopped on a deke attempt. "(Flames trainer Kent Kobelka) comes down and says, 'Johnny's gotta go. The spotters have called for him.' That's all I know," Flames head coach Bill Peters said after the game. "Hopefully it's nothing. Hopefully, it's minor. But we'll see." Gaudreau scored his 100th NHL goal in the game and is off to a fast start with six goals and three assists in six games. The Flames have started fast as well, bringing a 4-2 record into Friday. Nashville is off to a slightly better start at 5-1. Their only defeat was at the hands of Calgary, a 3-0 final in Tennessee on Oct. 9. Nashville hasn't played since Tuesday when they downed the Minnesota Wild at home 4-2. They flew to Alberta on Thursday afternoon. The Predators will face Calgary and immediately head to the airport for the brief flight north to Edmonton, where they will face Connor McDavid and the Oilers on Saturday. No problem, says Predators forward Ryan Hartman. "That's part of the job," he told nhl.com. "There's plenty of other jobs that people do in life where they're not getting much sleep. It's just part of it." With the back-to-back it's likely the Predators will put Pekka Rinne in goal in Calgary and go with his backup Juuse Saros in Edmonton. That's what they did on 11 occasions last season. Nashville has nine back-to-backs on their schedule in 2018-19. "Just because we have the backup in doesn't mean we can't win," defensemen Yannick Webber told nhl.com. "Juuse gives us a chance to win every game he plays. We've seen it already this year, too, and we have a lot of confidence in him. It's great to have that insurance back there." If Gaudreau is not in the lineup for Calgary on Friday, Calgary will hope for another strong outing from second-line winger, Michael Frolik, to fill the void. Frolik returned from being a healthy scratch on Wednesday and scored twice against Boston. "I didn't have the start I was looking for, but it's a long season," he told reporters. "I just try to work hard in practice, get better every day and hopefully it's going to turn around. "Tonight was a good start. Hopefully I can keep going." The Predators are led in the early going by Filip Forsberg's four goals and two assists through six games. Ryan Johansen has one goal and five helpers.